Our gold coloured, 2 gang double brushed brass plug sockets add an opulent touch to any room. 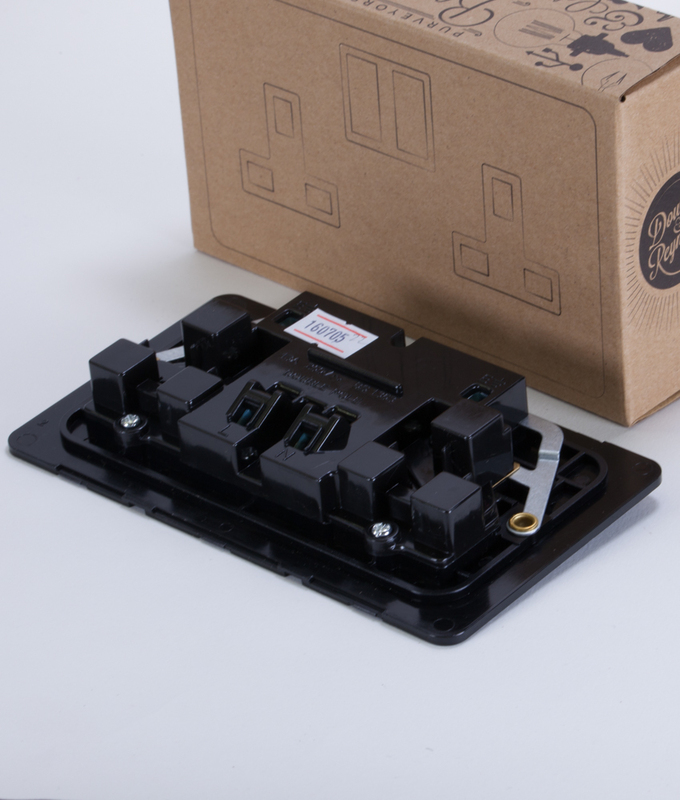 Featuring a solid brass screwless plate this high quality switch will stand the test of time. Our stunning gold double plug socket is really a double brass socket but don’t despair… Its beautiful brushed finish means this socket has a lovely soft, golden glimmer as opposed to the expected harsh, brassy yellow. More antique brass than brand new. This is a quality wall socket – it looks and feels substantial and is built to last. We designed all our electrical fittings ourselves, including light switches, dimmers and other electrical sockets to match. And only we sell them. Perfect if your someone who likes to have something a bit different from the crowd. We love this designer brass plug socket in a lounge or dining room – satisfy your guilty glamorous side that needs to be acknowledged every now and then! A small finishing touch is the perfect way to do this and a plug socket is, after all, totally functional. The golden hue of brass is a versatile colour to integrate into your interiors… Although less is definitely more, you don’t want your space looking like Midas’ palace! Gold perks up any rich shade including mulberry, myrtille, saffron, forest, obsidian and bitter chocolate. Delicious.